I'm giving away these eleven poetry books this week. Wow, what a fabulous group of books! I love poetry, what a lovely collection. They look beautiful! I'd love to add them to my library. This poetry lover would be blessed to win this week's selection. Entering and saying a prayer that random finds me. Thanks and have a blessed weekend. This poetry lover would love to win this week's selection. Entered and saying a prayer. Thanks for the chance and have a blessed weekend. 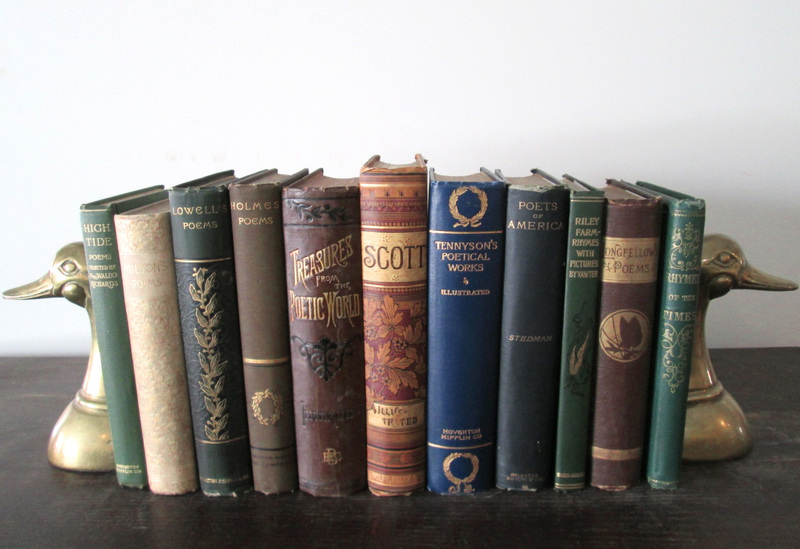 Love this great giveaway of antique poetry books! A bookworm since my childhood in the 50s & 60s, I and my daughter love reading and writing poetry and collecting antique books! Winning this would be awesome! Those beautiful books deserve a shelf of their very own! I have such a shelf... Fingers crossed! Ooo...I love poetry :) Thanks for the giveaway! Beautiful, I would love to add these to my collection!! What a joy they would bring,thanks for the chance!! I have a friend that will love these, I'm going to gift them to her if I win! These would greatly enhance my poetry collection. Thank you so much! I love antique books! Retweeted and entered on Facebook as Mary Dailey. Thank you!!!! This is a wonderful collection! WOW! This is such a great collection. I would love love love to have these! I love poetry so much. Thank you for the chance. Thank you for the chance to win words of hope and love and life. My library would be made richer with these works. what a great giveaway, these are must haves! What a fabulous way to while away the snowy nights! I would love, love, love this as an addition to my collection! I really hope I win these for my wife, she would be so happy to have them. I would like to compliment our library with these. I don't read them well but my youngest is a natural reader. I would love to win these, I am keeping fingers crossed! Thank you! Beautiful books. Very generous of you! I would LOVE to win this!!!!! This is an AMAZING Gift!!! Thanks for such a great giveaway! Please put my name in. I would love to win these, thanks! Amazing! Would love to enjoy these!